Stranger Things: I Want My ’80s Back! My fitness trainer Kim shared with me her iced coffee from Dunkin’ Donuts during our Monday night workout. According to Kim, this was no ordinary iced coffee. This one had been cold-brewed for 12 hours. Whatever that meant … it was a new offering on the menu. Honestly, I wasn’t expecting much. As much of a coffee addict as I am, iced coffee rarely calls my name. Dunkin’ Donuts Cold-Brewed Coffee: Heaven in a plastic cup. I took one tiny sip, just being polite. I was instantly transported. Were this a Twilight Zone episode, you’d see that bad special effect of me, sans color, dizzily spinning backwards in time, calendar pages flipping past me in fast succession. In my case, I time machined back to age six. I was standing on our kitchen stool so I could reach the sink, washing the family’s dinner dishes. The first part of this evening chore meant washing my dad’s lunchbox tupperware, and his khaki-green metal coffee thermos. Dad had engraved his name into the side of the metal. I’d trace his signature with my fingertips as I was washing the outside of it. When no one was looking, I’d sneak a sip of its contents — his day-old java — pretending I was a grown up. (I know, I know … I’m still pretending.) 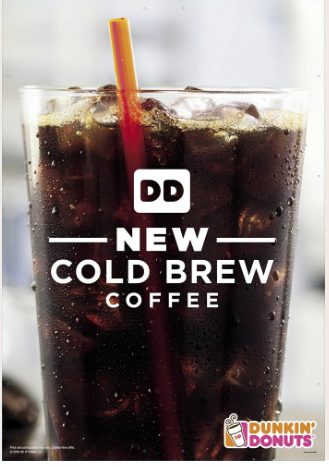 This Dunkin’ Donuts cold-brewed fare mimicked Dad’s day-old coffee, perhaps because Dad’s had steeped for a good 12 hours in his thermos. While it can’t bring my father back, the nostalgia of those lost days washes over me with every swallow. I’m hooked! 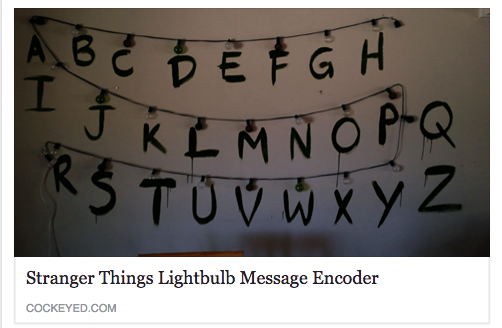 On the website CockedEyed.com, you can create your own “STRANGER THINGS” Lightbulb Message Encoder. How cool is that?!? The much-talked-about Netflix horror series Stranger Things became my other childhood time portal recently. I binge-watched the entire series in two nights. It was beyond amazing. Winona Ryder portrays the emotional fragility of a frantic parent as believably as Meryl Streep in Sophie’s Choice. Maybe moreso. The camaraderie feeling we get from Stephen King’s Stand By Me (and the origin story to that film, The Body) combines with the government conspiracy style narratives of Dean R. Koontz. The music, the fashion, the cars, the bad basement decor. The vulnerable, gawky, tender awkwardness of being a teen. It all felt so familiar — like an old friend returning. A friend I didn’t realize I had been yearning for as hard as I had. Posted on August 25, 2016 by DaveandDeniseDorman	• This entry was posted in '80s Music, Comic Book Wife, Entertainment, Fandom, Geek Culture, Life Observations, Mommy Blogger, Music, Nerd Culture, Paranormal, Pop Culture and tagged '80s, 1980s, Binge-watching, Conspiracy Theory, Dance It Off With Kim, Dean R. Koontz, Dunkin' Donuts Cold Brewed Coffee, Elgin Fitness, Elgin Trainer, Elgin Zumba, Entertainment, Fitness Trainer, Gen-X, Horror, I Love the '80s, Iced coffee, Kimberly Slancik, Meryl Streep, Netflix, Nostalgia, Pop Culture, Retro, Sci-Fi, Sophie's Choice, Stephen King, Stranger Things, Thermos, Twilight Zone, Winona Ryder. Bookmark the permalink.